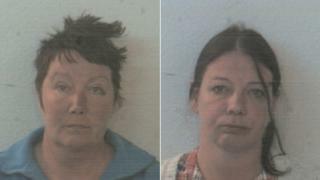 Two care home managers who stole thousands of pounds meant for vulnerable residents in their care have been jailed. Mandy Sargent, 49, and Joanne Brownhill, 47, were both sentenced to three and half years in prison at Sheffield Crown Court. Police said they stole more than £120,000 from 22 residents over seven years at Mansfield View in in the city. The pair pleaded guilty to the fraud at an earlier hearing. Det Con Jenny Elsley said "because a large number of records were destroyed we may never know the full extent of their deception". More on this and other South Yorkshire stories. She added: "The victims' families entrusted these women to care for their relatives and instead, they abused their positions as senior management to exploit these individuals for financial gain. "At no point throughout our investigation or legal proceedings have either of the defendants offered any explanation, apology or remorse. " Sargent, of Wickersley, Rotherham, and Brownhill of Killamarsh, Sheffield, were senior managers at the home, which provides accommodation for adults with moderate to severe learning disabilities. They were responsible for giving out money held by the NHS on behalf of the residents but falsified and destroyed records and took the money for themselves. The women were suspended by Sheffield Health and Social Care NHS Foundation Trust in 2013. Police were called after a review of Mansfield View by auditors revealed significant financial discrepancies. The force said inquiries under the Proceeds of Crime Act were underway to attempt to reclaim the money taken.